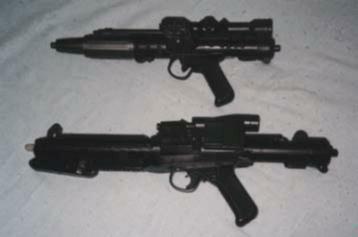 Imperial Blasters: The Stormtrooper blaster on the bottom was made by Marco Enterprises and is completely a heavy plastic resin with some battle damage on it. The tip lights up and there are sound effects, but if it can't blow open a door what fun are they? [G] The top picture is of an Imperial Officer's pistol, the maker is unknown, but it is very heavy resin with a metal core and great weight to it (my favorite style...also used by the Rebel troopers at the beginning of A New Hope but with a silver flash suppressor).